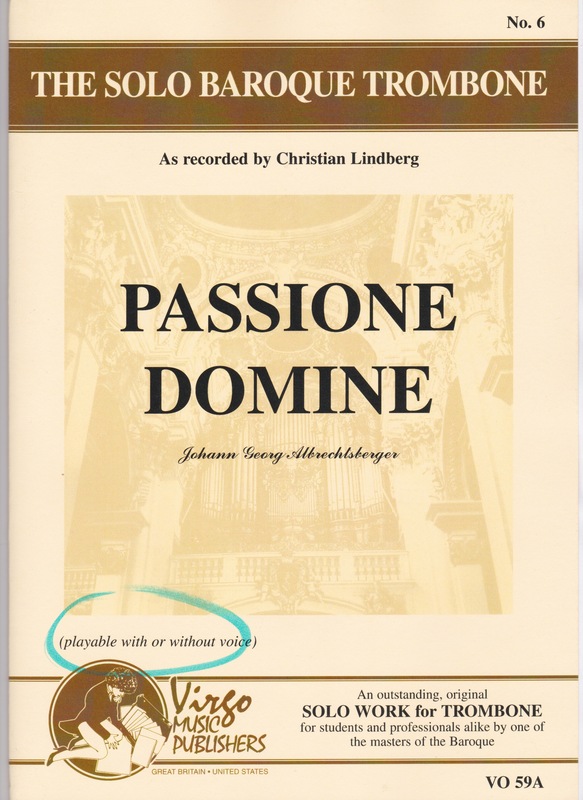 Passion Domine was uncovered by Kenneth Hanlon during the course of his research for his DMA dissertation. The parts were found in the archives of the Maria Taferi Church in lower Austria where the composer Johann Georg Albrechtsberger was employed as an organist in 1757. Subsequently, Albrechtsberger moved to Vienna as an organist and Kapellmeister. The score was reconstructed by Dr. Hanlon. The work was originally for solo alto voice, solo obbligato alto trombone, two violins, cello and organ in da capo aria style. Hanlon has kept the original instrumentation and also added an optional alto trombone part that combines the solo voice melodies and the obbligato part into one part allowing for performance without voice. This work is also available from Virgo music as part of a two aria set. The work is in ABA form with the solo alto voice featured in the B section for both verses. The opening and closing A sections without voice feature the obbligato trombone and violin whose motives echo one another. As originally composed, the obbligato trombone part is a quite playable alto trombone solo. Range is well within reach of novice alto players and the abundance of rest makes the 8-minute work much less physically demanding than it could be. The editing includes slurs, triplet signs, accidentals, dynamics, and ornaments. The ornaments are clearly marked and playable, including notated trills. When performed without the solo alto voice, the endurance demanded by the trombone part rises significantly. It is still playable but will require extended practice to build the required stamina. Performance without the solo voice also reduces the timbre variations of the original. Either version works, however the original version with solo alto voice, in this reviewer’s opinion, is preferred. All parts are clearly marked with no page turn issues. The cello part has optional passages if alto voice is omitted. This is a beautiful work, an excellent addition to the alto trombone repertoire. It is musically challenging, enjoyable to perform, and playable for college and professional alto trombonists.